KUALA LUMPUR: The Dewan Rakyat is to debate today an emergency motion on the pollution crisis triggered by the dumping of chemical waste in a river in Pasir Gudang, Johor. Speaker Datuk Mohamad Ariff Md Yusof allowed the motion tabled by Pasir Gudang MP Hassan Abdul Karim, saying it fulfilled the criteria under Standing Order 18(1) as “a define matter of urgent importance”. He said the motion will be debated for 60 minutes from 4.30 pm. When tabling the motion, Hassan urged the government to declare an emergency in Pasir Gudang due to what he said is the bad air and water pollution in the area following the dumping of chemical waste in Sungai Kim Kim. “Statistics clearly show that the toxic material pollution that started in Pasir Gudang in the Tebrau parliamentary constituency has now spread to the Pasir Gudang parliamentary constituency, affecting the whole of Pasir Gudang and making it unsafe. “The hundreds of thousands of residents in Pasir Gudang are now exposed to the dangerous toxic chemical pollution that began with the dumping of chemical material in Sungai Kim Kim that flows over 1.5 kilometres. The fumes from the toxic chemical are in the air and are being spread all over by the wind. “This has made the residents to panic and worry. 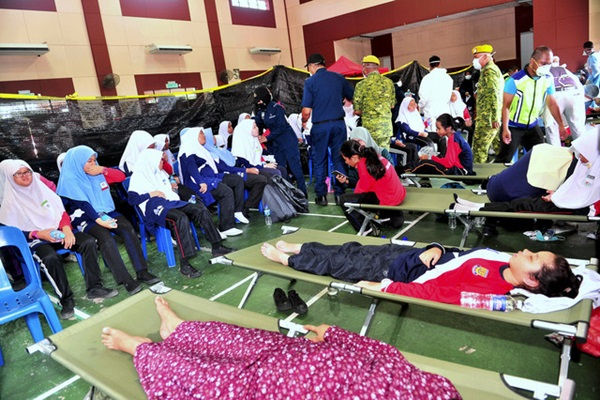 The Dewan Rakyat must debate this toxic chemical pollution crisis in the interests of the residents of Pasir Gudang to ensure they are assured of their health,” said Hassan. From 7 to 8 pm yesterday, 947 people, many of whom were students, had been treated in hospital for inhalation of the toxic fumes, nine of them in intensive care.